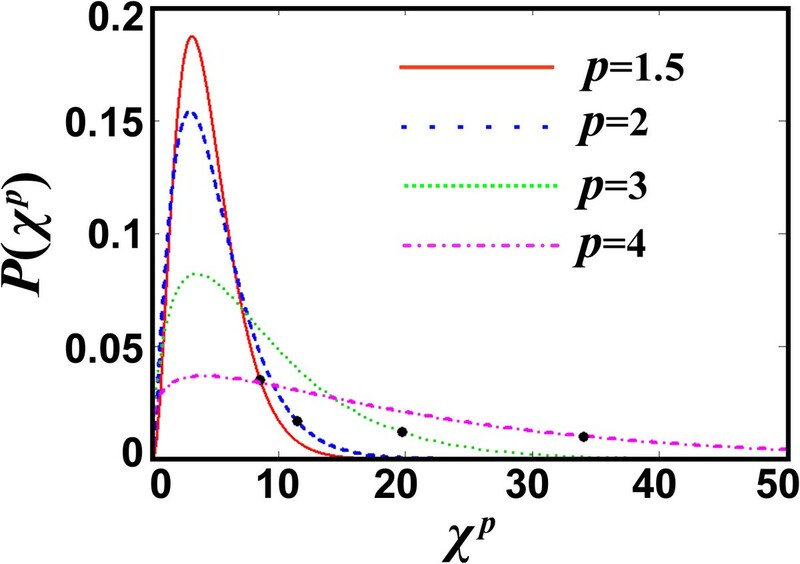 This paper derives (1) the Chi-p distribution, i.e., the analog of Chi-square distribution but for datasets that follow the General Gaussian distribution of shape p, and (2) develops the statistical test for characterizing the goodness of the fitting with L p norms. It is shown that the statistical test has double role when the fitting method is induced by the L p norms: For given the shape parameter p, the test is rated based on the estimated p-value. Then, a convenient characterization of the fitting rate is developed. In addition, for an unknown shape parameter and if the fitting is expected to be good, then those L p norms that correspond to unlikely p-values are rejected with a preference to the norms that maximized the p-value. The statistical test methodology is followed by an illuminating application. TAD α = ∑ i = 1 N σ f i - 2 f i - V x i ; α .
TD α p = ∑ i = 1 N σ f i - p f i - V x i ; α p .
The least square method based on the Euclidean norm, p = 2, and the least absolute deviations method based on the “Taxicab” norm, p = 1, are some cases of the general fitting methods based on the L p -norms (see Burden and Faires1993; for more applications of the fitting methods based on L p , see: Sengupta1984; Livadiotis and Moussas2007; Livadiotis2008;2012; for fitting methods based on other effect sizes e.g., correlation, see: Livadiotis and McComas2013a). The goodness of the least square fitting is typically measured using the estimated Chi-square value, that is the least squared value, χ est 2 = TSD α * 2 . Then, this χ est 2 is compared with the Chi-square distribution, to examine whether such a value is frequent or not (see next sections). However, this test can apply only to datasets f i ± σ f i i = 1 N that follow the normal distribution f i ~ N μ f i , σ f i . There is no similar test for cases where the dataset follows the General Gaussian distribution of shape p, f i ~ GG μ f i , σ f i , p (see Section 2 and Appendix A). Livadiotis (2012) showed the connection between the fitting with L p norms, as in Eq. (3), and datasets that follow the General Gaussian distributions, f i ~ GG μ f i , σ f i , p .
The purpose of this paper is to (1) construct the formulation of the Chi-p distribution, the analog of Chi-square distribution but for datasets that follow the General Gaussian distribution of shape p, and (2) develop the statistical test for characterizing the goodness of the fitting with L p norms, which corresponds to datasets that follow the General Gaussian distribution of shape p. Therefore, in Section 2, we revisit the Chi-square derivation, and following similar steps, we construct the Chi-p distribution. In Section 3, we develop the statistical test for characterizing the goodness of the fitting with L p norms, using the Chi-p distribution and the p-value. In Section 4, we provide an application of the statistical test. Finally, in Section 5, we summarize the conclusions. Appendix A briefly describes the General Gaussian distribution, while Appendix B shows the mathematical derivation of the surface of the sphere of higher dimensions in L p space. P X ; N dX = 2 - N 2 Γ N 2 e - 1 2 X X N 2 - 1 dX , with X ≡ χ 2 . The estimated value of the Chi-square for a fitting is given by the minimum at α = α* of the function χ2(α) = TSD(α)2, as shown in Eq. (1) (least squares). Considering that the Chi-square minimum, χ2(α*), is equivalently referred to all the M = N-1 degrees of freedom (for N number of data), then each of them contributes to this minimum by a factor of 1 M χ 2 α * . This is the estimated value of the reduced Chi-square. For multi-parametrical fitting (Livadiotis2007) of n free parameters, the degrees of freedom are M = N-n. In general, the Chi-square distribution in Eq. (5) is referred to M degrees of freedom. C p = p sin π p 4 π p - 1 , η p = sin π p Γ 1 p 2 π p p - 1 p 2 . Proposition 1: The L p -normed mean of the distribution (6) is < x > p = μ, ∀ p ≥ 1. Proposition 2: The L p -normed variance of the distribution (6) is σ p 2 = σ 2 , ∀ p ≥ 1. General Gaussian distribution P(z; p) for z = ( x - μ )/ σ . This is depicted for various shape parameters p = 1, 1.5, 2, 3, and 10. The larger the value of p, the more flattened the maximum is. The proofs of the two Propositions are shown in Appendix A.
Β p , N = p 2 p Γ 1 p N / Γ N p .
The proof is shown in Appendix B.
χ p = ∑ i = 1 N x i - μ x i σ x i p .
where the estimated Chi-p value X is given by the minimum at α = α* of the function χ p (α) = TD(α) p , as shown in Eq. (3) (least L p deviations). Figure 2 plots the Chi-p distribution for various values of the shape parameter p (that correspond to various L p norms). where the coefficients (Livadiotis2012) are given by Eq. (7). Chi-p distribution function. This is depicted for various norms p = 1.5, 2, 3, and 4. The degrees of freedom are M = 5. The black points correspond to the estimated values of χ p for the fitting example in Section 4. Therefore, we observe that by varying the L p norm, both the Chi-p distribution and the estimated χ p also vary. P X ; N ; p dX = η p N p Γ N p e - η p X X N p - 1 dX , with X ≡ χ p .
In general, for M degrees of freedom, the Chi-p distribution is given by Eq. (10). χ 2 = ∑ i = 1 N σ f i - 2 f i - V x i ; α 2 . We begin with the established method of Chi-square, and then we will proceed to the generalized method of Chi-p. The goodness of a fitting can be estimated by the reduced Chi-square value, χ red 2 = 1 M χ test 2 , where M = N-1 indicates again the degrees of freedom. The meaning of χ red 2 is the portion of χ2 that corresponds to each of the degrees of freedom, and this has to be ~1 for a good fitting. We can easily understand this, for example, when the given data have equal error σ f , with f i ± σ f i = 1 N , i.e., σ f i = σ f for all i = 1,...., N. Then, the optimized model value, V(x i ; α*), gives the expected value of the data point f i , so that the variance can be approached by σ f 2 = 1 M ∑ i = 1 N [ f i - V ( x i ; α * ] 2 (sample variance). Hence, the derived Chi-square becomes χ est 2 = σ f - 2 ∑ i = 1 N f i - V x i ; α * 2 = M , and its reduced value χ red 2 = 1 M χ est 2 = 1 . Therefore, a fitting can be characterized as "good" when χ red 2 ~ 1 , otherwise there is an overestimation, χ red 2 < 1 , or underestimation, χ red 2 > 1 , of the errors. When the deviations of the data f i i = 1 N from the model values V x i ; α i = 1 N are small, the fitting is expected to be good. However, this characterization is meaningless if the errors of the data σ f i i = 1 N are either (i) quite larger than their deviations from the model values, i.e., if σ fi > > |f i - V(x i ; α)|, or (ii) quite smaller, i.e., if σ fi < < |f i - V(x i ; α)| (e.g., see Figure 3). Then, a perfect matching between data and model is useless when the errors of the data are comparably large or small. Possible values of the reduced chi-square and their meaning. (a) Seven data points are fitted by a statistical model, here a straight line. (b) When the errors are too small (underestimation), the calculated reduced Chi-square is χ red 2 > 1 , and the fitted line does not pass through the data points or their error lines. Other more complicated curve can fit better the data (dash line). (c) In the case where the errors are similar to the deviations of the data points from the model, the reduced Chi-square is χ red 2 ~ 1 , and the fitting is good. (d) Finally, when the errors are too large (overestimation), the reduced Chi-square is χ red 2 < 1 . In this case, the fitted line does pass through the data points or their error lines, but the curves of any other model can also pass through these, leading to good fitting; hence, the rate of the fitting is meaningless. P χ est 2 ≤ χ 2 < ∞ = ∫ χ est 2 ∞ P χ 2 ; M d χ 2 = Γ 1 2 M ; 1 2 χ est 2 Γ 1 2 M .
(see some applications in Livadiotis and McComas2013b; Frisch et al.2013; Funsten et al.2013). Note that the maximum p-value is 0.5, and this corresponds to the estimated Chi-square χ est , 2 1 / 2 ≅ M - 2 3 . This is larger than the Chi-square that maximizes the distribution, χ est , 2 max = M - 2 . Hence, χ est , max 2 < χ est , 1 / 2 2 , i.e., the Chi-square that corresponds to p-value = 0.5, is located always at the right of the maximum. The statistical test of the fitting for the evaluation of its goodness comes from the null hypothesis that the given data are described by the fitted statistical model. If the derived p-value is smaller than the significance level of ~0.05, then the hypothesis is typically rejected, and the hypothesis that the data are described by the examined statistical model is characterized as unlikely. T + 1 / 2 = 2 p log 2 . We can easily now characterize the testing rates by a linear separation of the values of T, as shown in Table 1.
p - value = min Γ 1 p M ; η p χ est p Γ 1 p M , 1 - Γ 1 p M ; η p χ est p Γ 1 p M .
Note that the maximum p-value = 0.5 corresponds to the estimated Chi-square χ est , 1 / 2 p ≅ 1 p η p M - 1 3 η p . This is larger than the Chi-square that maximizes the distribution, χ est , 1 / 2 p ≅ 1 p η p M - 1 η p . Hence, again we find χ est , max p < χ est , 1 / 2 p .
The statistical test has double role in the case of L p norms. If the shape parameter p is known, then the test can be rated by deriving the p-value and according to Table 1. 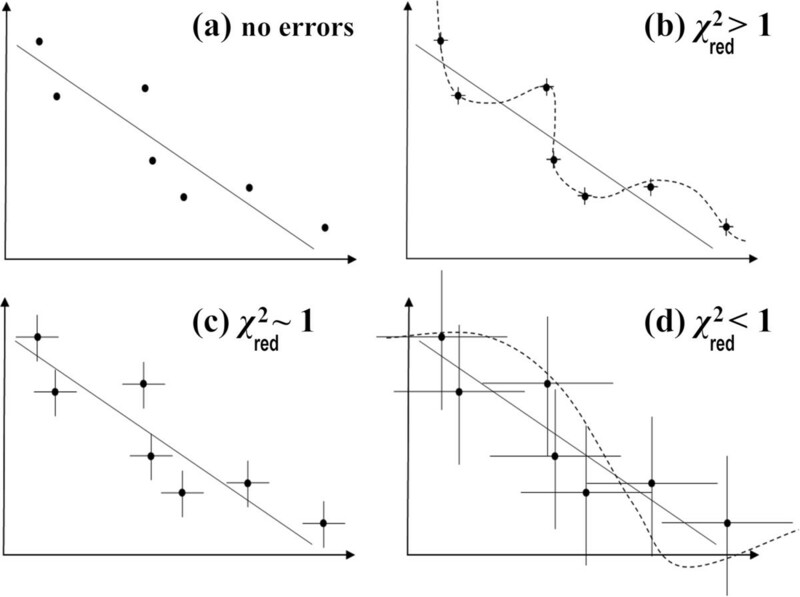 If the shape parameter is unknown and the fitting is expected to be good, then all the shape values p that correspond to unlikely p-values can be rejected. In fact, the largest p-value corresponds to the most-likely shape parameter p of the examined data. These are shown in the following applications. Table 2 contains a dataset of observations of the ratio of the umbral area to the whole sunspot area, f i i = 1 N , N = 6 (Edwards1957). Assuming that each of them follows a General Gaussian distribution about their mean, f i ~ GG(μ i , σ i , p), what is the likelihood of these measurements to represent a constant physical quantity? Let this constant be indicated by μ p , which can be derived from the fitting of f i ± σ f i i = 1 N , and thus, it is typically depended on the p-norm. However, different values of the p-norm lead to different estimated values of the Chi-p, χ est p . Thus, the p-value of the null hypothesis (Ho) depends also on the p-norm. χ p p = ∑ i = 1 N f i - α p σ f i p .
Figure 4(a) shows the six data points co-plotted with four values of α p , that correspond to p → 1, p → ∞, and the two shape parameter values p1, p2 for which the p-value is equal to 0.05. 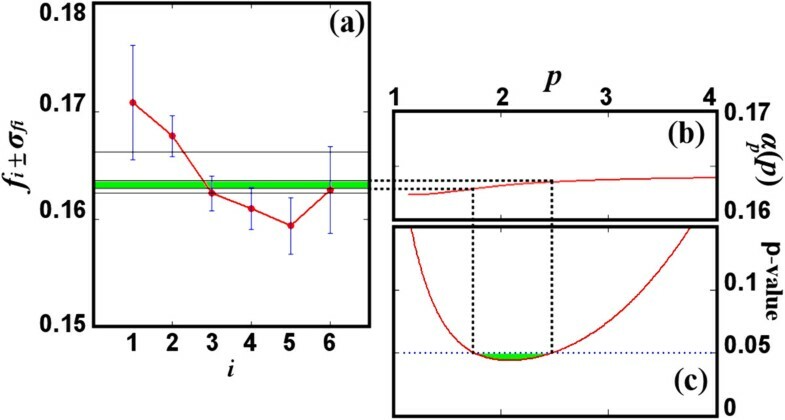 The whole diagram of α p = α p (p) is shown in Figure 4(b) and the p-value as a function of p is shown in Figure 4(c). Statistical test for the rate of fitting based on L p norms. (a) The dataset of Table 2 is co-plotted with four values of α p , that correspond to p → 1, p → ∞, and the two shape parameter values p1 ~ 1.7 and p2 ~ 2.5 for which the p-value is equal to 0.05. (b) The diagram of L p mean values, α p = α p (p). (c) The p-value as a function of p. We observe that for the Euclidean norm p = 2, the null hypothesis is rejected, i.e., the sunspot area ratio data are not invariant with the heliolatitude. However, if the examined data are expected to be invariant, and thus the null hypothesis to be accepted, then the norms between p1 and p2 (green) are rejected because lead to p-value < 0.05.
α ∞ = x min σ x min + x max σ x max 1 σ x min + 1 σ x max ≅ 0.166 . The p-value has a minimum value at p ~ 2.08 and increases for larger shape values p until it reaches p ~ 5.77 where becomes p-value ~ 0.5 (not shown in the figure). If the shape p of the dataset is known, e.g., p = 2, then the null hypothesis is rejected, i.e., the sunspot area ratio data are dependent on the heliolatitude. On the other hand, if the data are expected to be invariant with the heliolatitude, and thus the null hypothesis to be accepted, then all the norms between p1 ~ 1.7 and p2 ~ 2.5 are rejected, and the norm L p with p ~ 5.77 characterizes better these data points; the respective mean value is given by α p (5.77)~0.164. Therefore, if we know the shape/norm p that characterizes the data, we can proceed and rate the goodness of the fitting. However, if p is unknown, at least we could detect those values of p for which the null hypothesis is accepted or rejected. p - value ~ e M p η p χ est p M p e - η p χ est p .
Method for determining the characteristic p-norm of the data. (a) Normalized histogram of N = 104 data of a random variable that follows the General Gaussian distribution of zero mean, unity variance, and shape p = 3. (b). The fitting of the data by a line at z = 0 is characterized by a p-value that is maximized at the p-norm p ≅ 2.95 ± 0.08, that coincides with the characteristic shape parameter of the data p =3 . This is shown in Figure 5(b), where the peak is at p ≅ 2.95 ± 0.08. Therefore, the p-value is maximized at the same value of p-norm as the shape of the General Gaussian distribution. This paper (1) presented the derivation of the Chi-p distribution, the analog of Chi-square distribution but for datasets that follow the General Gaussian distribution of shape p, and (2) developed the statistical test for characterizing the goodness of the fitting with L p norms, which corresponds to datasets that follow the General Gaussian distribution of shape p.
It was shown that the statistical test has double role in the case of L p norms: (1) If the shape parameter p is fixed and known, then the test can be rated by deriving the p-value. A convenient characterization of the fitting rate was developed. (2) If the shape parameter is unknown and the fitting is expected to be good for some shape parameter value p, a method for estimating p was given by fitting a General Gaussian distribution of shape p to the data, and then use this estimated shape parameter p to the Chi-p distribution to characterize the goodness of fitting. In particular, all the shape values p that correspond to unlikely p-values can be rejected, while the largest p-value corresponds to the most-likely shape parameter p of the examined data. This was verified by an illuminating example where the method of the fitting based on L p norms was applied. σ p 2 = ∫ - ∞ ∞ P x x - < x > p p dx p - 1 ∫ - ∞ ∞ P x x - < x > p p - 2 dx . Next, we derive the L p -normed mean and variance of the General Gaussian distribution (6), which are Propositions 1 and 2, stated in Section 2. Proposition 1: Given the distribution (6), we have that the L p -normed mean is < x > p = μ, ∀ p ≥ 1. Proposition 2: Given the distribution (6), we have that the L p -normed variance is σ p 2 = σ 2 , ∀ p ≥ 1. < z q > = C p 2 p η p - q + 1 p Γ q + 1 p .
σ p 2 = ∫ - ∞ ∞ P z z p dz p - 1 ∫ - ∞ ∞ P z z p - 2 dz ⋅ σ 2 = η p - 2 p Γ 1 + 1 p p - 1 Γ 1 - 1 p ⋅ σ 2 = σ 2 . This appendix shows the proof of Lemma 1, stated in Section 2. Lemma 1: The surface of the N-dimensional sphere of unit radius in L p space, Β p,N, is given by Eq.(8). This is involved in the proof of Chi-p distribution (10), as shown below. P X ; N ; p = C p N 1 p Β p , N e - η p X X N p - 1 . Β p , N = p η p N p / C p N Γ N p = p 2 p Γ 1 p N / Γ N p .
a i , p ≡ ∫ 0 1 1 - t p i p - 1 dt . Β p , N = 2 N ⋅ ∏ i = 1 N - 1 a i , p .
Β p , N = p 2 p N Γ 1 p N - 1 ⋅ ∏ i = 1 N - 1 Γ i p / Γ i + 1 p .
Since, ∏ i = 1 N - 1 Γ i p / Γ i + 1 p = Γ 1 p / Γ N p , finally, we end up with Eq. (B4).